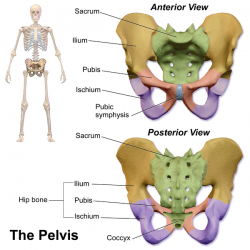 Today, let’s talk about the structure of the pelvis. I’m not going into much detail because if you’re interested, you can always ask Mr. google and hit a million websites that will describe it in the depth of your dreams. Here, we only discuss what “I,” think “YOU” should know. During the early stage of our life (i.e. kids), the different colors parts described in the picture used to be separate bones. Then, at puberty, the Ilium, Pubis, and Ischium all FUSE together and left with a less complicated structure. 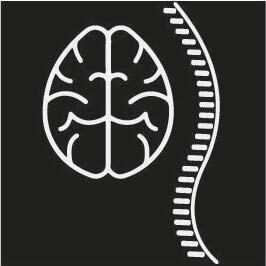 As adults, we are left with a set of Hipbones, a Sacrum, tailbone, and a cartilage (Pubic Symphysis) at the front. 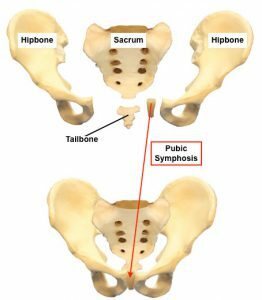 If anything could go wrong in the pelvis, it’s usually related to conjunctions in the front (Pubis Symphysis) or the back (SI Joint).